1. 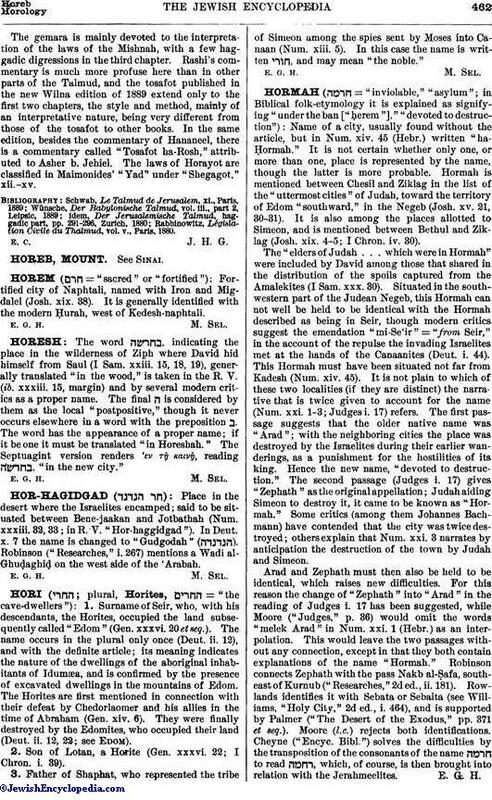 Surname of Seir, who, with his descendants, the Horites, occupied the land subsequently called "Edom" (Gen. xxxvi. 20 et seq.). The name occurs in the plural only once (Deut. ii. 12), and with the definite article; its meaning indicates the nature of the dwellings of the aboriginal inhabitants of Idumæa, and is confirmed by the presence of excavated dwellings in the mountains of Edom. The Horites are first mentioned in connection with their defeat by Chedorlaomer and his allies in the time of Abraham (Gen. xiv. 6). They were finally destroyed by the Edomites, who occupied their land (Deut. ii. 12, 22; see Edom). 2. Son of Lotan, a Horite (Gen. xxxvi. 22; I Chron. i. 39). 3. Father of Shaphat, who represented the tribe of Simeon among the spies sent by Moses into Canaan (Num. xiii. 5). In this case the name is written , and may mean "the noble."